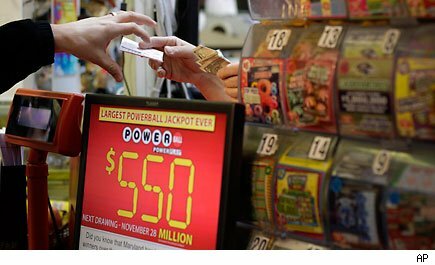 BREAKING: From the Associated Press: "Lottery officials say Powerball winner is man in 30s from Fountain Hills, Ariz."
PHOENIX, Dec 7 (Reuters) - The holder of a winning lottery ticket bought in Arizona has come forward to claim half of a record $587.5 million Powerball lottery jackpot, the Arizona lottery said on Friday. The ticket holder, who has not been identified, shares the huge prize in the Nov. 29 draw with a Missouri couple, Mark and Cindy Hill, who claimed their prize a week ago. The Arizona winner, who bought the ticket at a food store in the Phoenix valley but did not immediately come forward to claim the prize, has opted to take $192 million before taxes rather than a larger annuity payment over 30 years, the lottery said. Lottery authorities were due to hold a news conference later in Phoenix to provide further details, although they said the winner had declined to participate. The popular lottery - which is played in 42 states, the District of Columbia, and the U.S. Virgin Islands - had not had a winner for two months. Hopes of winning the vast prize spurred frenzied ticket sales in the days before the draw, boosting the prize by more than $260 million.